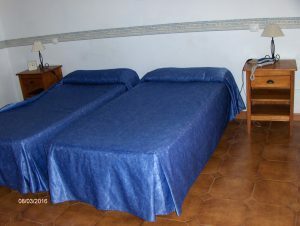 One of our Pueblo Torviscas holiday rentals, this studio is on the ground floor and can sleep up to 2 people. It has satellite TV and has 2 single beds. Have just returned from a absolutely fabulous holiday on the Pueblo Torviscas complex in Costa Adeje, Tenerife. He booked a studio in H block through Karen from Holidays4u.org. We were travelling as a couple, for our wedding anniversary. Although on the basic side, which was reflected in the price, the apartment was clean and well maintained. The complex itself if also fabulous. Most mornings, we visited the Club House for breakfast, which was great. The staff at the complex were very friendly and they spoke English very well, which is great as my Spanish is not very good. And of course it is in a great location, being very close to the sea front and beach and all the surrounding bars and restaurants. Our apartment was on the ground floor with a very large terrace. We love Harleys Restaurant which is a short walk away. We were there most evenings and the staff got to know us quite well before the end of our holiday and were giving us free brandies at the end of our meals. Although the pool on the complex is great, we also liked to go to the beach on most days. Torviscas Playa has all the amenities which you would expect from a tourist resort, including water sports, a beach bar, sun loungers, sun umbrellas with little tables. You have to hire the sun beds though. Most days we just took towels to lie out on. The beach has water breakers, so the sea wasn’t too rough, unlike some other beaches in Tenerife. A guy came round selling slices of pineapple, but to be honest it was a bit expensive. So having agreed to buy on the first day we declined the offer on all the following days.